More than 1,100 people attended the annual Sheep Shearing Day at Watson Farm in Jamestown, Rhode Island, on May 7, a beautiful sunny day. 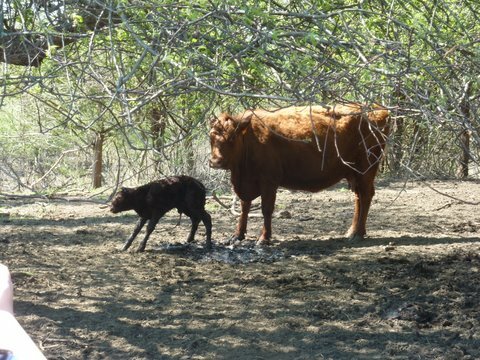 As Farm Manager Don Minto led sixty visitors on a farm tour, one of the Red Devon cows went into labor and produced a healthy heifer calf. Everyone was delighted to watch it take its first steps to its mother. Also at the event, the Rhode Island Spinners Guild presented a “Fleece to Shawl” demonstration in which both the warp and weft were hand-spun yarns from Watson Farm sheep that were shorn last year. Spinners made the pale gray weft yarn at the farm, then used it to weave a shawl in an eight-harness basket weave throughout the day.